In my first post I talked about the Red Hook Houses, Brooklyn’s largest New York City Housing Authority (NYCHA) site and home to over 75 percent of the Red Hook community. We can now look further into the well-being of the different Red Hook populations – later we will explore the social and economic impacts of these statistics and how they make Red Hook such a unique community. The surrounding tracts are 53 and 59 – they’re similar enough (for now) to eloquently refer to them as “the rest of Red Hook” as we explore the Houses today. Tract 85’s demographics are split (almost) evenly between black and Hispanic/Latino, 60 percent of the population is female, and the median age is 31. 83 percent of the individuals in the Houses do not own a vehicle, compared to 40 percent in tracts 53 and 59, or the rest of Red Hook. Education and economic status are outlined below. — There are five public schools in Red Hook: two charters, two elementary schools, and one transfer high school. Both elementary schools (located within blocks of the Red Hook Houses) and one of the charters report that only 10 to 20 percent of students reach or exceed both English and math proficiency. — The unemployment rate in the Houses is 25 percent. 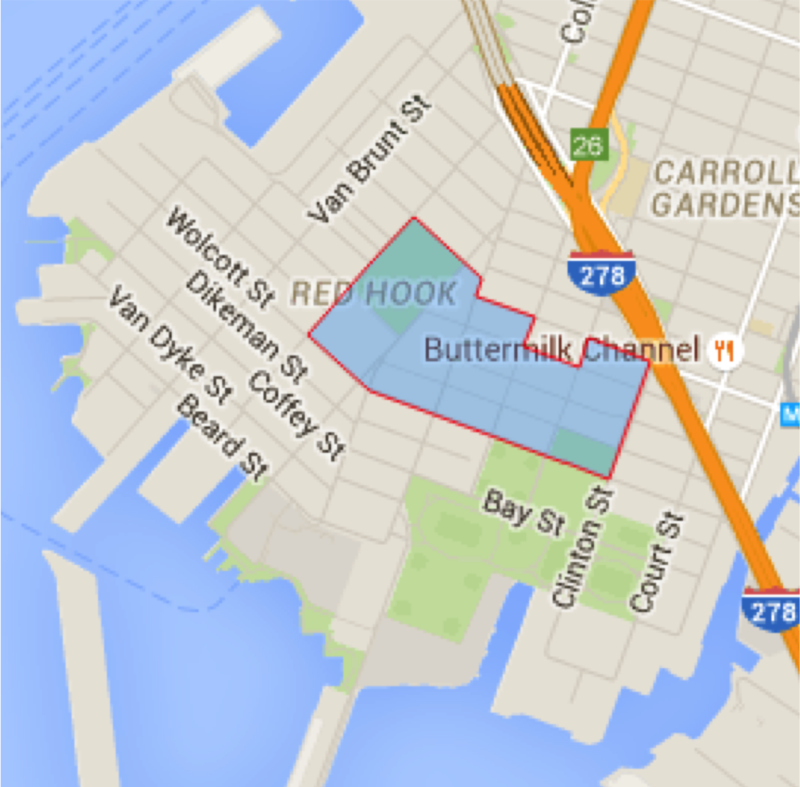 The rest of Red Hook hovers between 10 and 15 percent. — 50 percent of people in the Houses have lived below the poverty level in the last 12 months. This falls to around 17 percent in the other two tracts. The nonprofit organization Measure of America, housed in Brooklyn Heights and led by Red Hook resident Sarah Burd-Sharps, put together this accessible fact sheet that provides more information.